Scenes from Roman life. Based on the soviet ballet “Spartak” (1954) by Aram Khachaturyan.Dedicated to the 70th Anniversary of the Uprising in the Warsaw Ghetto. Some time ago, the entrance to my apartment building was vandalized by unknown teenagers. The graffiti they left all over the walls called for killing “khaches", i.e. people of Caucasian origin. It also called for "CSKA", a Moscow football club, to beat its rival “Spartak.” It is interesting that the "CSKA" was originally a military club (this is Russian abbreviation for Central Sport Club of the Army), while “Spartak” was founded by proletarian sportsmen from Red Presnya, a Moscow district with an illustrious revolutionary history. Strangely enough, myth and reality, history and the present, sport and war came together in my building. As in the past, military forces (now associated with fascism and nationalism) attacked the revolutionary proletariat. It is even more interesting that my building is located near Baumanskaya metro station, built by the famous Soviet architect Boris Yoffan. The station was supposed to be named “Spartakovskaya” in honor of Spartacus; somehow this plan didn’t work out, and the name “Spartak” was given to a square and a street nearby instead. So I am surrounded by Spartacus. He is dissolved in my everyday life. The film is made on the genre intersection point of documentary, silent movie and theatrical performance. I set the story of gladiators' rebellion led by Spartacus (71-73 BC) in contemporary Moscow and simultaneously in the revolutionary past and maybe in some unpredictable future. The scene is located in former industrial space in front of Arch of Titus constructed in a scaled-down form wrapped in floor cloth. Migrant workers from Kirghizstan feature in this film. They play both Romans and gladiators. I try to show that there is always possibility to resist even in a situation of exception in the state of emergency. At the same time, I also criticize the ambivalence and passivity of the migrants’ position. p.s. Few month later after the film was finished two ugly events related to migration happened in Russia: 1. Moscow authorities organized "transit" camps for illegal migrants in Moscow which later were removed to a special prison in Moscow district. 2. Mass "pogroms" on migrant food market took place in Moscow neighborhood Biruljovo. The pogroms were followed by the action called "White car" when large groups of Russian nationalists have violently attacked migrants (non-Slavic looking people) in Moscow metro and all over the country. 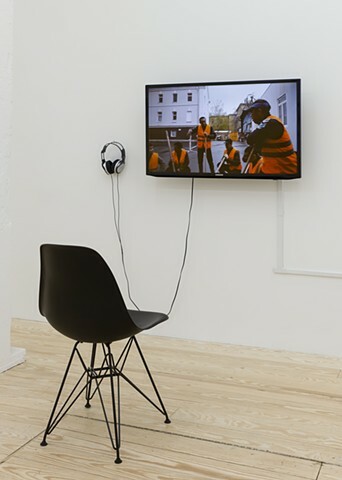 Haim Sokol is an installation, sculpture, and video-based artist whose practice addresses the dramatic social histories of Russia and Eastern Europe. Though many of his works teeter on the edge of fiction and fantasy, Sokol roots his use of literary allusion in historical reality and the legacy of major 20th century uprisings, revolutions, massacres and genocides. By compounding the grim realities of urban life with the complexity of exile and socio-political diaspora, Sokol’s works effectively capture experiences of alienation, isolation and disrupted communication. Sokol is a graduate of the Hebrew University in Jerusalem (1996) and the Moscow Institute of Contemporary Art (2007). After receiving professional acclaim for his project Foundation Pit in 2008, Sokol has exhibited in solo exhibitions at the M&J Guelman Gallery, Triumph Gallery, Anna Nova Gallery and other galleries in Moscow and St Petersburg. He has participated in the First Indian Biennale (Kochi-Muziris, 2012), Mediation Biennale (Poznan, Poland, 2010), the Third Moscow Biennale of Contemporary Art (2009), the Second Biennale of Contemporary Art in Thessaloniki (Greece, 2009), the First Moscow Biennial for Young Artists (2008), the exhibition Russian Povera (Perm Museum of Contemporary Art, Russia, 2008) and other exhibitions in Russia and internationally.